According to the World Bank, 30% women farmers are beneficiaries of the STAR-P project. 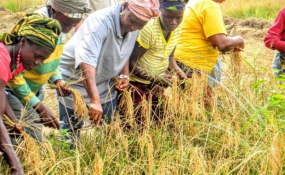 In continuation to further increase the productivity of smallholder farmers for commercial purpose, the World Bank Board of Executive Directors, on Tuesday, January 15, 2019, approved an International Development Association (IDA) credit of $25 million for the Smallholder Agriculture Transformation and Agribusiness Revitalization Project (STAR-P) of Liberia. The 5-year project is expected to increase agricultural productivity and commercialize 17,500 smallholder farmers for selected value chains (rice, oil palm and horticulture) in Bomi, Grand Cape Mount, Lofa, Nimba and Margibi counties. According to the World Bank release, 30 percent of the targeted beneficiaries of the STAR-P are women farmers. However, the beneficiaries of project services must be active resident smallholder farmers in the project locality, who are already engaged in producing one of the targeted value chains and must be a member of a farmer-based organization (or willing to become a member). These farmers will, accordingly, benefit from increased income accruing from productivity increases and improved access to markets for the sale of their products," the release added. The STAR-P is aligned with the World Bank Group's (WBG) twin goals of ending extreme poverty and boosting shared prosperity, and the emerging priorities of Liberia's new administration as reflected in the government's five-year Pro-poor Agenda for Prosperity and Development (PAPD). The project focuses on the economic empowerment of rural poor farmers, and will directly contribute towards increasing shared prosperity and helping Liberia tackle its worsening challenge of poverty. "Supporting agriculture with focus on enhanced private sector investment, and key value chains will ensure economic diversification, Pro-poor growth and boost food security," said Larisa Leshchenko, World Bank-Liberia Country Manager. Leshchenko said emphasis will be placed on addressing critical market failures limiting the development of the rice, oil palm and horticulture value chains. The project, she said, would be seeking to increase agricultural productivity and promoting smallholder commercialization by facilitating private sector investment in selected value chains. It will also strengthen productive links between smallholder farmers and selected agribusiness firms through a business climate lens. Adaptation approaches and mitigation measures will be applied for rice and oil palm production to enhance the climate resiliency of production and to minimize climate risks. "The STAR-P is a transformative project that intends to commercialize the operation of smallholder farmers, while attracting private sector investment into agriculture. This is an opportunity for Liberians in the Diaspora to make meaningful profitable investment in agriculture," said Co-Task Team Leaders, Abimbola Adubi and Adesimi Freeman. The project, the release said was designed based on extensive consultations with the clients, private sector, the International Finance Corporation of the WBG and development partners to leverage resources from both the public and private sectors. It will seek to support institutional capacity-building and strengthening the enabling environment for farmers, state and non state actors; enhance productivity and competitiveness; and boost project management, monitoring and evaluation, citizens engagement, and contingency emergency response. Given the multi-faceted interventions required for a competitive commercial agriculture sector in Liberia, the targeted coordination and collaboration of STAR-P's activities with other development initiatives and the expected co-financing of US$23 million by the International Fund for Agricultural Development (IFAD) will augur well for the project's impact. The World Bank's International Development Association (IDA), established in 1960, helps the world's poorest countries by providing grants and low to zero-interest loans for projects and programs that boost economic growth, reduce poverty, and improve poor people's lives. It is is one of the largest sources of assistance for the world's 77 poorest countries, 39 of which are in Africa. Resources from IDA bring positive change to the 1.3 billion people who live in IDA countries. Since 1960, IDA has supported development work in 112 countries. Annual commitments have averaged about US$19 billion over the last three years, with about 50 percent coming to Africa.